01. The largest aquarium in the world The Georgia Aquarium is located in Atlanta, USA. This object is the main attraction of the capital of the American South. 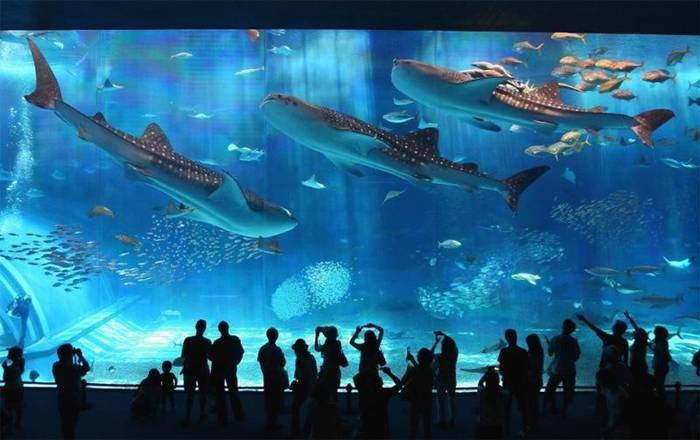 The volume of water of this amazing aquarium is about 31 thousand cubic meters, and lives in it for more than 120,000 live exhibits belonging to five hundred species. 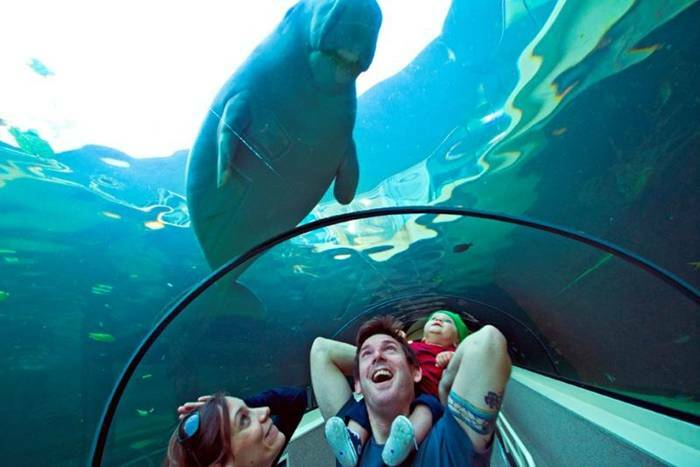 The largest animals aquarium beluga whale is, as well as several species of dolphins, whale sharks, skates and rays. Seaquarium offers five themed exhibitions, during a visit where you are immersed in the different ecosystems of the ocean. In 2012, the aquarium opened a thematic exhibition of frogs. The most impressive is the exhibition that recreates the life of the Mesoamerican Barrier Reef, where the aquarium is home to over one hundred thousand living beings. Visitors examine their lives from a transparent tunnel at the bottom of the aquarium, the length of which more than thirty meters. 02. Sydney Aquarium. opened after a major renovation, which spent about $ 10 million in 2012. 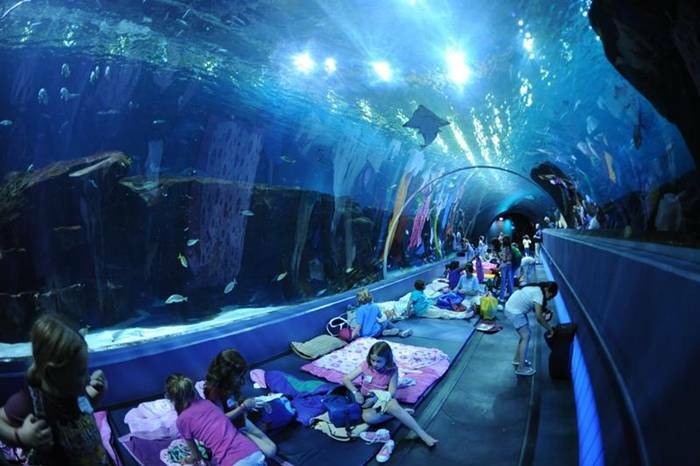 Now the aquarium is one of the main attractions of Australia. Exposure aquarium includes about seven hundred species of animals. 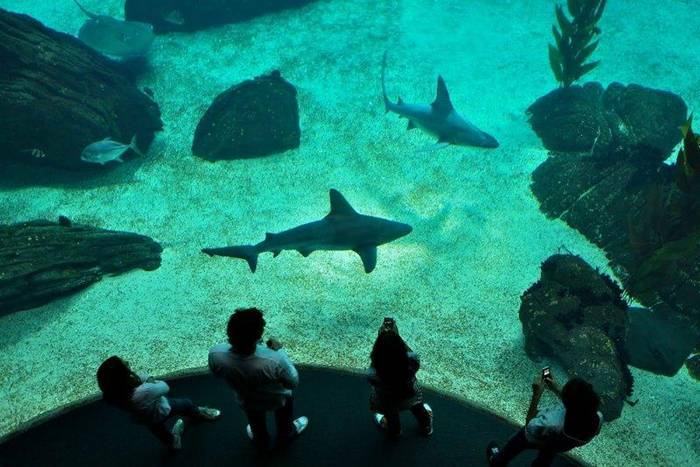 Especially convenient to observe the aquarium visitors to this the life of sharks that live in the aquarium "Open Ocean". Sharks swim so close to the visitors who are at the bottom of the Sydney aquarium in a glass tunnel that captures the spirit of fear and delight. Some of the sharks weigh three hundred pounds and reach a length of three meters. Seaquarium has interesting displays such as the "Abode of fur seals," "The Great Barrier Reef," "South Pacific." 03. 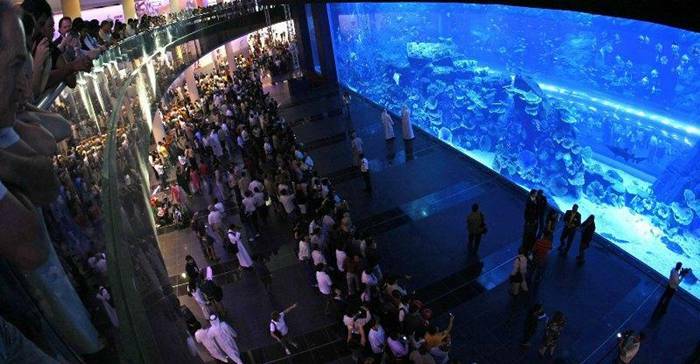 Dubai Aquarium & Discovery Center - a huge shopping and entertainment center in Dubai, which opened in 2008. Part of this center is a large aquarium with a capacity of about 33 thousand fish species and marine animals more than eighty-five species. Live here, and several species of sharks, including sand and a giant shark. This aquarium is known for its viewing window is listed in the "Guinness Book of Records" as the largest acrylic viewing window in the world. Its area is about 273 square meters, and it holds back thousands of tons of water. And the aquarium is the largest indoor aquarium in the world. Adventurers offered an unusual attraction - a dive with sharks. Certified divers can dive without preparation, and all the others are a short course of study. Over the oceanarium is "Discovery Center" where you can learn more about the life of marine animals, their biology and behavior. Not far from the aquarium is a fish restaurant. 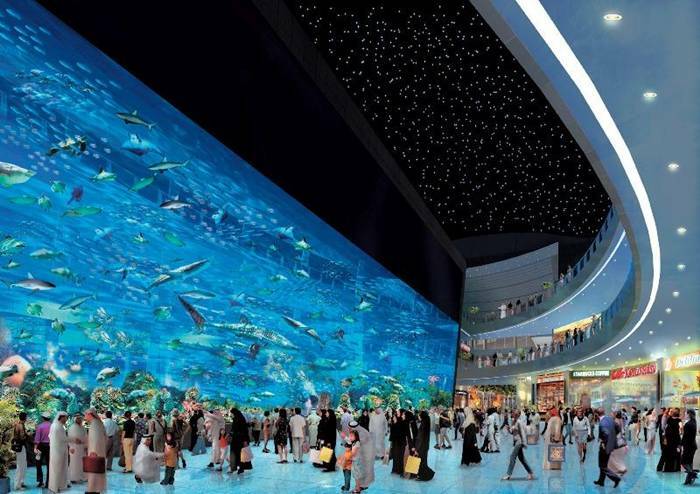 In addition to the aquarium, located in the heart of more than 1,200 stores, cultural and entertainment facilities. 04. Oceanário de Lisboa is located in Lisbon, Portugal . Located in the Park of Nations. 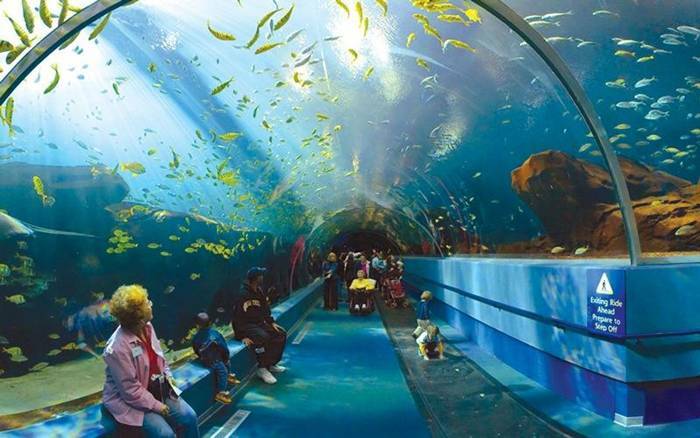 This is the largest aquarium in Europe, as it is created by American designers. 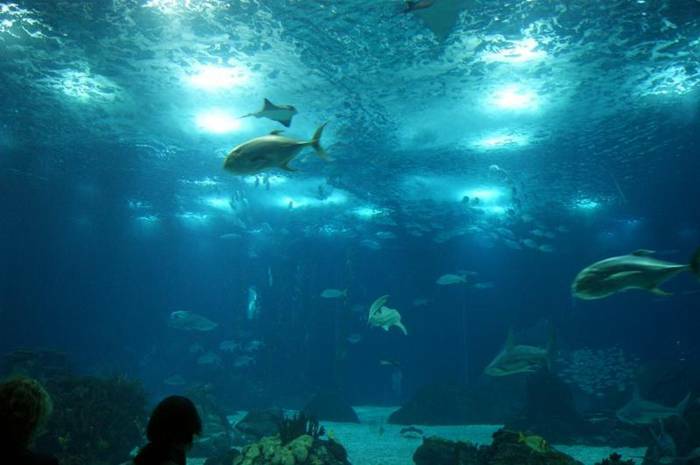 Oceanarium consists of five giant glass aquariums, each of which simulates the habitat of the Pacific, Atlantic, Indian, Arctic, the Arctic (or Southern) Oceans. Because of this, visitors can learn about the life of the world's oceans, see the brightest inhabitants of oceanic waters. 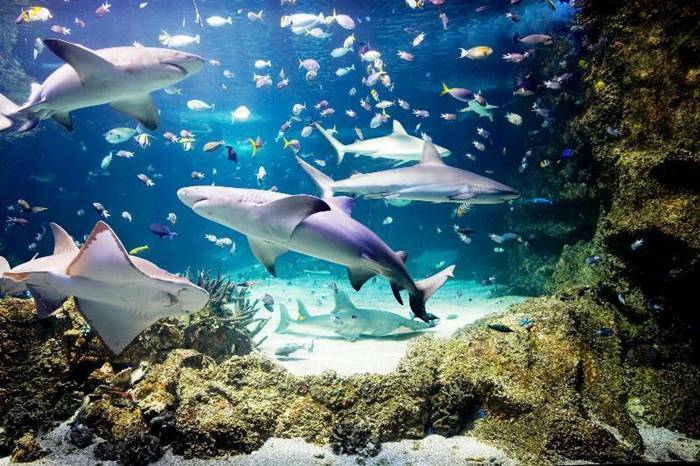 Sharks, rays, barracuda, tuna, moray eels and other feel at home here. In total, the aquarium inhabited by 16,000 individual animals over four hundred and fifty species. Lisbon Oceanarium is proud to have on display a fish-moon, which can not boast of other aquariums, as well as rare spider crab and sea otters. 05. 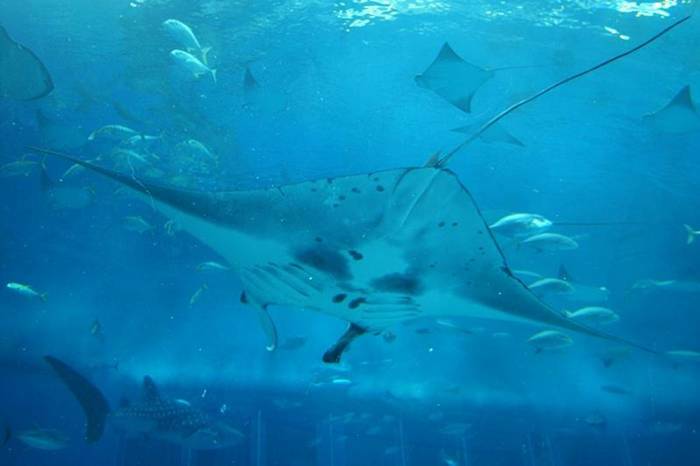 The Okinawa Churaumi Aquarium (Tyuraumi) is located in Japan, in Okinawa. Before the construction of the aquarium in Atlanta Tyuraumi was the world's largest such facility. Seaquarium has four floors and is designed to be able to fully display the life of the Japanese islands. Initially, visitors get acquainted with shallow waters and coral reefs, and then dive deeper into the ocean, going down deep into the aquarium until they are at the very back of the inhabitants of the mysterious depths of the ocean. Near the main aquarium are a few objects with marine life. This dolphin theater, an aquarium with manatees, as well as a separate turtle aquarium with five well-known large species of sea turtles. Aquariums are not only the amenities, but real science labs that allow for a lot of work on the study and conservation of oceanic species.